William Capps lived in Stoney Middleton at the end of the 17th century, and was a master in a particular style of wrestling and particularly famed for the remarkable fact that he was never beaten. William Capps, gentleman of Stoney Middleton was born at the end of the 17th century. Little is known of the family’s history or where they originated from. The exact place of residence cannot be pointed out with certainty, however parish pedigree records by Thomas Norris (1799-1860) state that the Bower family, who were originally from Ashford in the Water, had a large farm and corn mill under the Duke of Devonshire and were also owners of a house and land at Stoney Middleton. Records suggest this house and land was purchased for a family named Capps which became extinct on the death of William Capps in 1703. The Bowers sold the property at Stoney Middleton in the early 19th century. The starting back-hold position involves the wrestlers standing chest to chest, grasping each other around the body with their chins on their opponent’s right shoulder. The right arm of each contestant is positioned under his opponent’s left arm. Once the grip is taken the umpire gives the signal to start the contest by calling en guard, then wrestle. 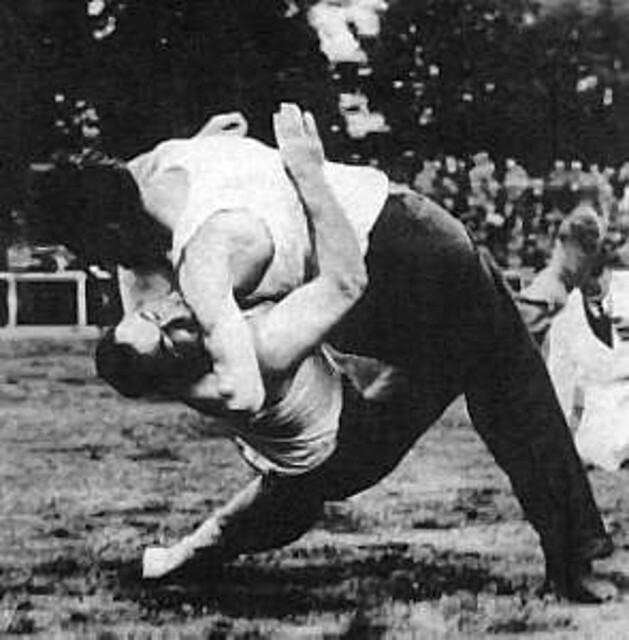 The wrestlers attempt to unbalance their opponent, or make them lose their hold, using methods such as lifting throws known as hipes, twisting throws such as buttocks and trips like the inside click, cross click, back heel or outside stroke. This is known as a fall. If any part of a wrestler’s body touches the ground aside from his feet then he loses. If both fall down at once the last to hit the ground is deemed the winner. If it is unclear which wrestler hit the ground first the fall is disqualified and must be started again. this is known as a dog fall. A win can also be achieved if either party loses his grip on the other while his opponent still retains his hold. To bring poor mortal Soules to th’ bar betimes. Above the inscription in white marble, was a well executed effigy of Capps on horseback, no doubt designed by the sculptor to convey to posterity an idea of his excellent horsemanship. The slab is no longer in the churchyard there is no record to what became of the slab. His name lived on till the early 20th century through the names Capps Close, Capps Barn and Big Capps Close, which once occupied the village, these acted as the last perpetuate to the memory of WILLIAM CAPPS. With thanks to Neil Maltby by whom the above article was kindly researched and provided. Below is a transcription of the administration of the estate of William Capps senior to his son Wm junior and of the inventory of Wm the elder’s goods. It was kindly transcribed by Glenn Trezza from Boston MA USA to whom we are very grateful. Glenn also comments. It looks like he had two properties when he died, a main home consisting of “the Parlour (sort of like a modern home’s “lounge” (what we in the states would call a “living room” or ironically, a “parlor”), the House (the various other more workaday rooms, including sometimes the kitchen), and various “Chambers”, “bedrooms” in modern parlance), and also “the old house” presumably an older, smaller home he’d lived in before he was as well off as he was later in life. He socialized with the upper crust of Stoney seemingly–James Fynney, Robert Wright, and William Tomlinson, who appraised his goods, were all local well-to-do gents.